Americans went back to work after a long Thanksgiving weekend to see panicky headlines trumpeting an 11-percent drop in Black Friday sales. This led to various "OMG, have people stopped shopping, did the rug just get pulled out from under the economy?" reactions. If the number freaked you out, don’t worry. You can safely ignore it. The data, based on a survey the National Retail Federation conducts every year, is serially unreliable. At Bloomberg View, Barry Ritholtz zeroed in on the dicey methodology that goes into estimating Black Friday sales in anything like real time. The number we have right now -- down 11 percent, everyone freak out -- comes from the NRF asking a few thousand people how much money they spent. The result is a number, but it’s a really inaccurate number. In an email to The Huffington Post, an NRF spokeswoman called Ritholtz’s piece an “annual temper tantrum” that was “slanted, flawed and predictable,” and compared it to “such holiday traditions as the Grinch and the threat of coal in one’s stocking.” The NRF did not cite any inaccuracies in Ritholtz’s column, nor did it provide any substantive criticism of his views or mine. The NRF noted it reached out to Ritholtz about his criticism of the survey last year, but that he did not respond. As Ritholtz noted, just asking people how much they spent is actually a bad way to figure out how much they actually did spend or plan to spend. There’s also a good and growing case that the weekend after Thanksgiving just isn’t as important to stores or consumers as it used to be. If you really want to estimate holiday spending before we have solid numbers, you should look backwards: Sales in the first 10 months of the year are very, very closely correlated with sales in the holiday season. And right now that indicator suggests the U.S. is on track for a 6-percent increase in holiday shopping from a year ago. Shoppers, stores, and the media freak out about Black Friday and holiday shopping generally, but amid the frenzy there is a soothingly recurring EKG-like pattern to consumer spending in America, with predictable spikes in December. Since 1992, there has been a .989 correlation between the total January through October sales, and total November through December sales, with 1.0 being perfect positive correlation and 0 being no correlation at all. And through the first 10 months of the year, things looked just fine. 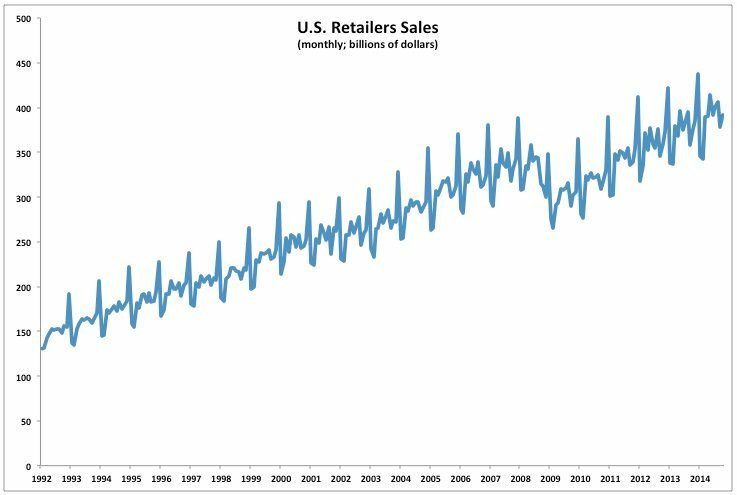 If this year is like the past two decades, retail sales will be up more than 6 percent compared to last year. Throw in the economic stimulus of tumbling gas prices, and things could be much better than the 4.1 percent increase retailers projected. In other words, ignore the bad data and scary headlines about plummeting Black Friday sales. Everything -– probably –- is going to be fine.